Former chairperson of the Law Commission, Justice AP Shah today questioned why the money collected under the Swachh Bharat Cess [SBC], is not being utilised to ensure dignity and respect for the people who risk losing their lives while cleaning sewer, which is recognised as manual scavenging. “I won’t make any political commentary, but I want to ask why no money collected under the SBC has not been dedicated for this purpose?”, he asked, while speaking at a press conference organised in New Delhi to mark 100 days of Bhim Yatra, a journey being undertaken by the safai karamcharis from around the country, which takes them to all the states of the country. According to the press release issued at the press conference, they are carrying a message of pain and anguish at the regularity with which sewer deaths occur even after sewer cleaning has been banned by the Prohibition of Employment as Manual Scavengers and their Rehabilitation Act, 2013. Justice Shah said that it is a shame that the removal of human excreta from toilets by several lakhs of manual scavengers continues, and practically all of them are Dalits. They suffer the stigma of exclusion from mainstream society because of the nature of their work, he added. He recalled that during the hearing of the manual scavenging case in the Supreme Court - which resulted in a judgment in March 2014 - many Judges refused to accept the fact that such shameful practice continues. He deplored that while disposing of the case, the Supreme Court asked the petitioners not to come back to the Apex Court, but instead knock the doors of the high courts, in case they face problems in implementing the judgment. Justice Shah expressed his distress over the Supreme Court’s conclusion in that judgment that no further monitoring was required. In Delhi, he claimed that the process of identification of manual scavengers, has not started. The 2013 Act could not be implemented, let alone the question of rehabilitation. “It takes us back to the classic example of law being only on paper”, he commented. “We hear talk of ending caste discrimination, and promoting skill development, but in practice, the opposite happens, and we must hang our heads in shame for this failure”, he lamented. Chapter VI (Section 119) of the Finance Act 2015 contains provisions for levy and collection of SBC. The Government has announced 15th November, 2015 as the date from which the provisions of Section 119 would come into effect (notification No.21/2015-Service Tax, dated 6th November, 2015 refers). Simultaneously, Government has also notified levy of SBC at the rate of 0.5% on all taxable services. Effectively, the rate of SBC would be 0.5% and new rate of service tax plus SBC would be 14.5%. As such SBC translates into a tax of 50 paisa only on every one hundred rupees worth of taxable services. 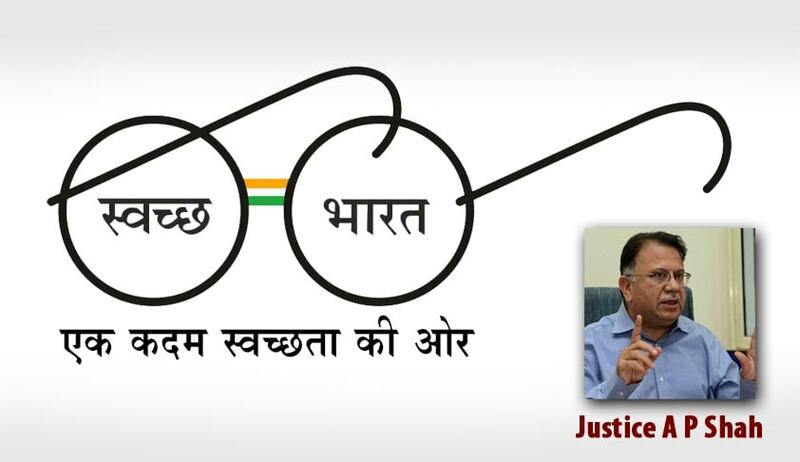 The proceeds from this cess will be exclusively used for Swachh Bharat initiatives, the Government had claimed. Proceeds of the SBC are credited to the Consolidated Fund of India, and the Central Government may, after due appropriation made by Parliament, utilise such sums of money of the SBC for the purposes of financing and promoting Swachh Bharat initiatives or for any other purpose relating thereto. CPI Member of Parliament from Rajya Sabha, D Raja, who also addressed the press conference, pointed out that in the 2015 amendments to the Child Labour (Prohibition and Regulation) Amendment Bill, 2012, which is pending in Parliament, there is an exception to children engaged in family enterprise after school hours. Raja apprehended that this provision may be misinterpreted to include manual scavenging as a family enterprise. The Bhim Yatris are reaching New Delhi on 13 April, and planning to meet the President, Pranab Mukherjee, to apprise him of their plight.